I went to this mall the other day and I saw this strange looking urinal. 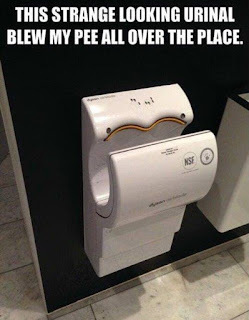 It did blow the pee all over the place. Luckily I was standing at a safe distance. After doing my duty when I went to the wash basin to wash my hands, I noticed another man walking up to this urinal and put his hands inside. I frowned at him and gave him a dirty stare and told him "Sir, you look like an educated man. But why would you do that?". He stared back at me and walked away. These days men don't have manners. I was just trying to correct him and he was not ready for any correction. Talking about urine, you can't easily hold it up for a long time. Men and women are wired differently. Women beat men hands down in holding it up inside for even hours together. But for men, if they have to go, they have to go. This is why, you often see men peeing in Indian roads. One may say that men don't have decency. But the reality is that India does not have that many public toilets and the country is designed in such a manner that allows men to pee anywhere and everywhere they want. You definitely can't put a gun on your bladder and say "Stop". I am reminded of my professor "Suresh" (Name changed) who was dead against men peeing in the road. He would come to class and give long lectures on why it is wrong to pee on the road side and how it affects our environment and why as MBAs we are not supposed to do that. He used the term "Barbarians" to describe such people. He would use this word everyday in class. We had no clue why he was so much concerned about people who pee in public. We decided to teach him a lesson or two. So when we all went out on our college trip, we decided to trap him. The easiest solution we had in our hands was the chilly mango effect. We cut mangoes into small pieces and sprinkled chilly powder on it. Through out the journey, we gave chilly coated mangoes and plenty of water. We made sure that he drank at least 2 liters of water in a short span of time. It was a 8 hour journey to the destination and we knew that his bladder will be playing mind games with him in no time. And so it happened that he could not hold it up any longer. He asked the bus driver to stop the bus and soon as the bus stopped, he got down to ease himself. We utilized the golden opportunity to click a picture of him peeing ( from his back). As soon as he got back into the bus, we started singing "WE ARE THE BARBARIANS" in "we are the champions" tune. He immediately got the message. The word Barbarian committed suicide in his dictionary that day. Moral: Tomato sauce for us and blood for others. This applies to lot of things that happen around us.